Regularly voted as one of the best beaches in Thailand and indeed Asia, Kantiang Bay is located towards the southern end of Koh Lanta, a 45 minute drive from Saladan Village. It’s a much quieter, more secluded beach than Klong Dao or Long Beach and boasts some of Koh Lanta’s best soft golden sand which stretches for nearly 2 kilometers. 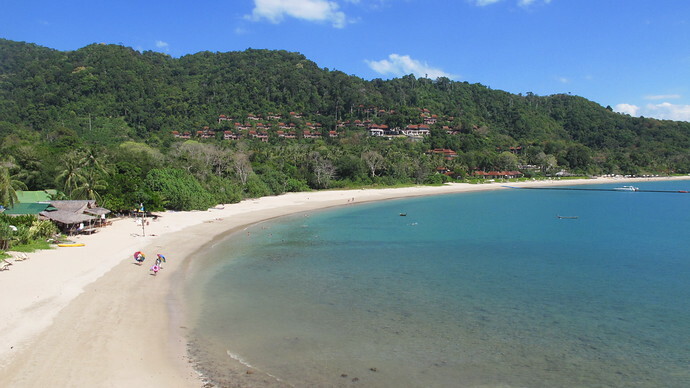 Kantiang Bay is most famous as the location of Pimalai, Koh Lanta’s first luxury hotel. There are now several other hotels, resorts and villas on Kantiang Bay which we recommend. Click on any link to view more photos, read guest reviews and book online. 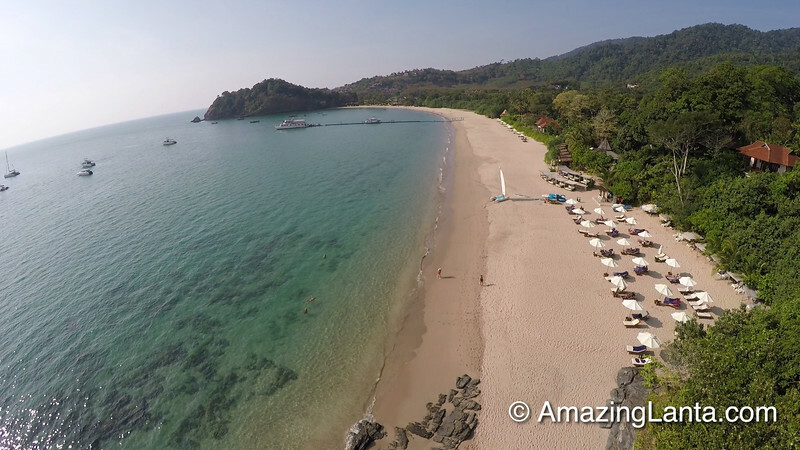 Kantiang Bay creates a perfect crescent shape to keep the Andaman Sea flat calm with crystal clear water. Looking up from the beach beyond the road, you will see the mountain range which provides breathtaking scenery around the bay. Even on a busy day you may find yourself sharing the beach with only a handful of people. It’s a perfect choice for honeymooners and couples who want peace and quiet and get away from the masses. With a short walk from the beach up to the main road you will find a handful of shops. These includes a few Internet & travel shops, clothes shops, a few ATMs and a Beauty Salon, not forgetting the usual 7 Eleven. Drunken Sailors Bar and Coffee shop is a great place to relax and unwind. For more suggestions about eating and drinking, see Best Kantiang Bay Restaurants and Places To Eat. There is a large variety of accommodation in Kantiang Bay, particularly for more upmarket resorts and villas. Enjoy your own space and privacy by hiring a Kantiang Bay villa – many have private pools and breath-taking views over the bay and ocean. Kantiang Bay tends towards the upmarket pricewise. 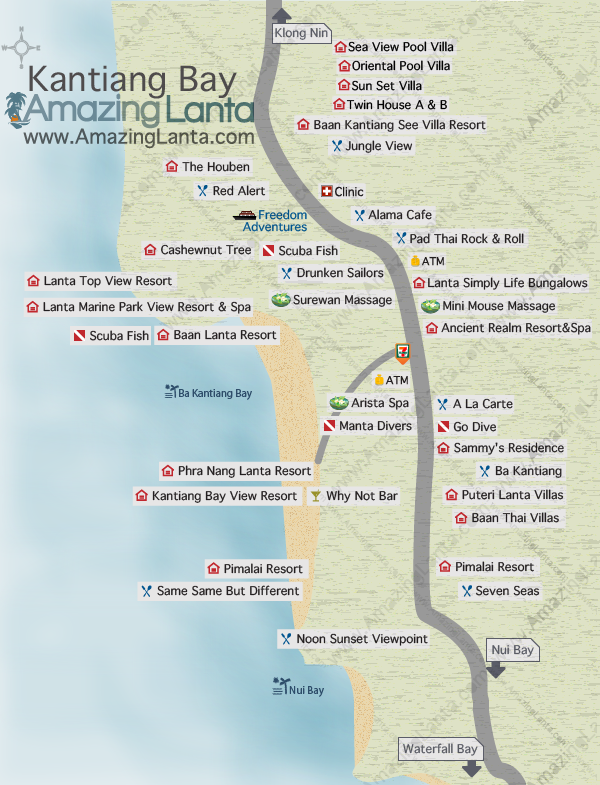 The location of the Kantiang Bay hotels and villas can also be found on our detailed map (see below). You can also see our Kantiang Bay Google Map below. Where Is Kantiang Bay Located? 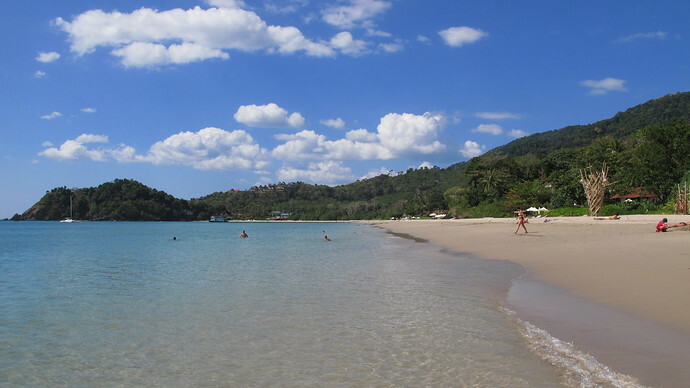 Kantiang Bay is located towards in the south of Koh Lanta. It’s about a 30 – 40 minute drive north to Saladan Village, which is where all visitors to Koh Lanta arrive – therefore it’s a quite long transfer from Saladan to any Kantiang Bay hotel. Precisely because Kantiang Bay is relatively secluded compared to northern Koh Lanta, many people love it because of its peace and quiet and general tranquility. There are a few other restaurants and bars in the Kantiang Bay area within walking distance of the main hotels and resorts, but you will need transport to visit other areas of the island. This can be organised by your hotel.